The River Severn's banks were overflowing across Shropshire and Mid Wales today with six flood warnings for towns and farmland along its course. 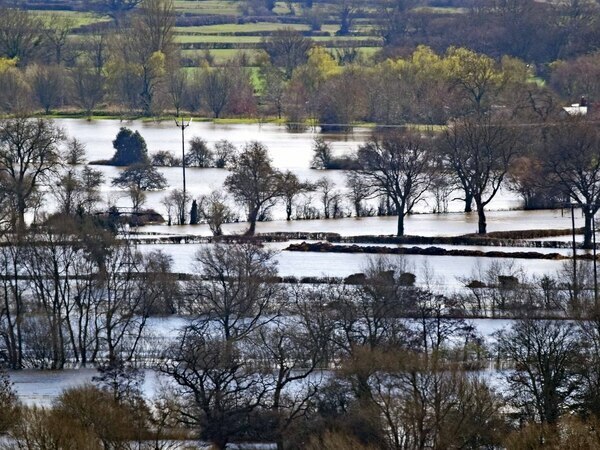 Hundreds of acres of farmland were flooded along the Shropshire/Wales border, while flood barriers remained up in Ironbridge, Bewdley and Shrewsbury, where Frankwell Car Park and The County Recreation Ground in Frankwell were totally submerged. 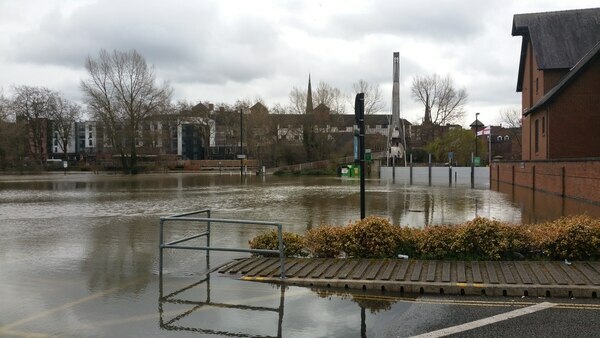 Although flood barriers kept the water out of most buildings in Frankwell - including Theatre Severn, the university centre and Shrewsbury Town Council's headquarters - the car park was covered by inches of water and closed to all vehicles as a result. The Riverside and St Julian's Friars car parks were also shut. Shropshire Council urged people to use the park and ride or car parks at Abbey Foregate and Ravens Meadows as cars filled side streets in the town centre after the river burst its banks in time for the Monday morning rush hour. 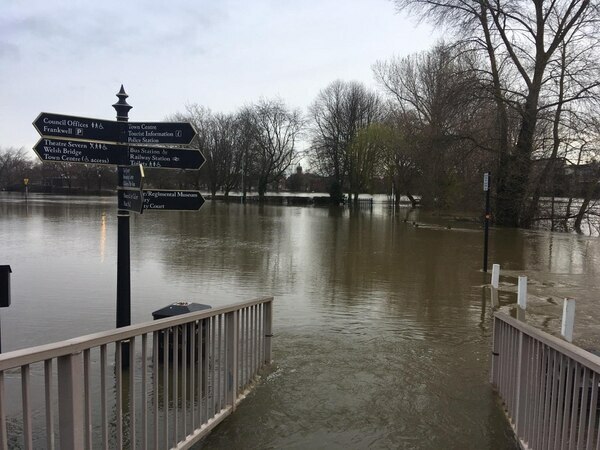 Towpaths remained flooded throughout the town and people were urged to keep away from the river in the Quarry Park, where water was covering large parts of lower-lying the grass and the town council had shut the public toilets and play areas. 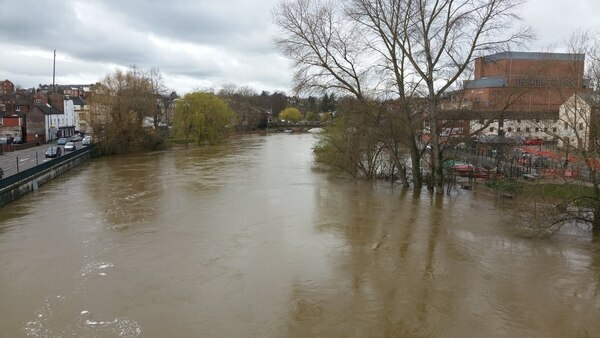 The Severn measured 3.87 metres at the Welsh Bridge Gauge at 7am and was expected to reach a peak of 3.9m in Shrewsbury at midday. The highest level ever recorded there was 5.25m on November 1, 2000. Shropshire Council said it was not expecting to close any more roads. 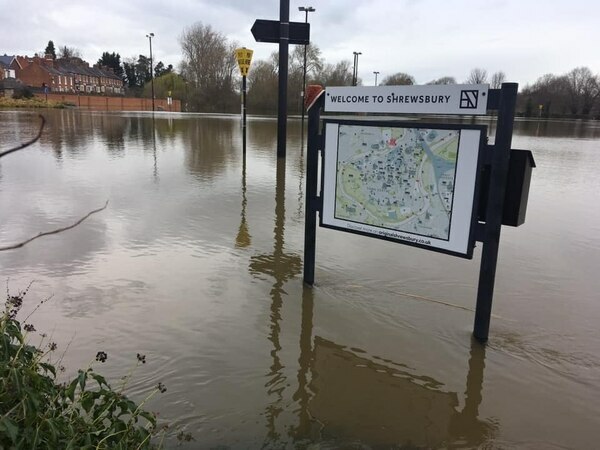 The Severn burst its banks at numerous other places in Shropshire including at Crew Green, Melverley and Montford Bridge, on the outskirts of Shrewsbury, threatening a nearby caravan park as waters rose rapidly this morning. 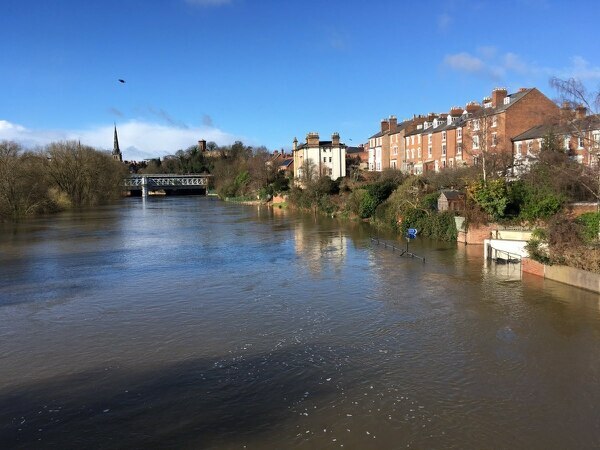 Crews had been busy over the weekend in Shrewsbury, Ironbridge and Bewdley putting up temporary barriers to protect homes and businesses, and government agencies predicted that river levels will stay high until Tuesday. 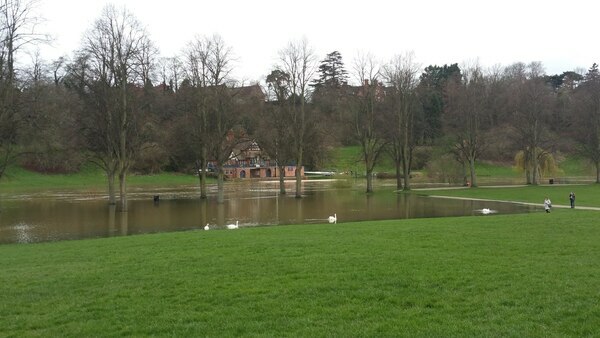 Dave Throup from the Environment Agency said: "The main peak on the River Severn is now approaching Shrewsbury. "Levels are beginning to drop slowly upstream with flood warnings now removed from the Severn/Vyrnwy confluence area but six remain in force downstream." 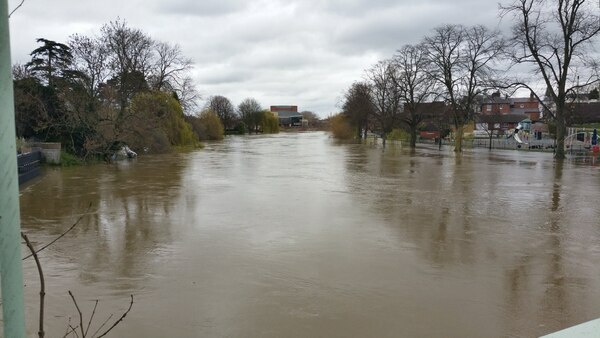 On Sunday Chris Bainger from the agency said that about 220 tonnes of water had flowed past the Welsh Bridge in Shrewsbury per second, and that the river was 3.5 metres higher than usual. 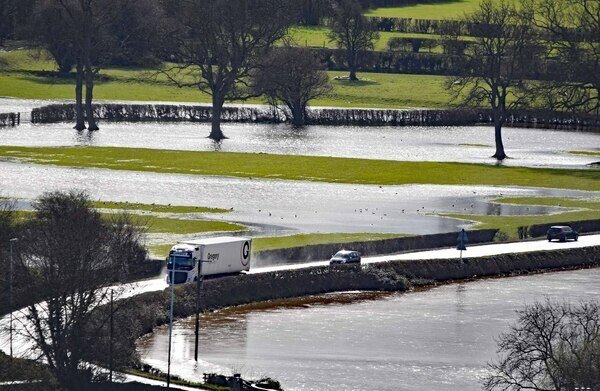 Photographer Graham Mitchell took a walk up Llanymynech Hill to take pictures of the flooded fields in the area, although the A483 trunk road remained passable to traffic thanks to engineering work over recent years. Various fields were also flooded in the Welshpool area. Across the north Shropshire border at Bangor-on-Dee, horses had to be led to safety from flooded fields. Rescuers went out on rafts to the 18 horses marooned on a piece of ground on high land and led them over the floodwaters to safety. North Shropshire Horse Watch group said it had found alternative grazing for the heavy horses. 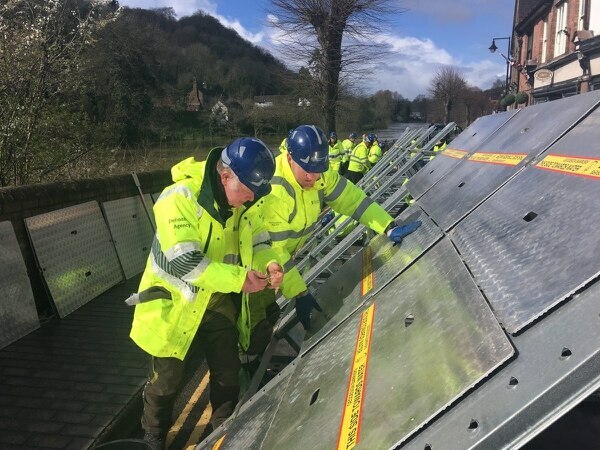 Flood barriers were put up in Ironbridge on Sunday, where the main road was closed to vehicles on Monday, while some properties on Ferry Road had been affected by the flooding. Telford & Wrekin Councillor Nicola Lowery, ward member for the Ironbridge Gorge, said businesses had seen an increase in traffic, despite the flood risks. "The Wharfage is closed to vehicle traffic and diversions are in place directing traffic via Jiggers Bank, A4169 and Madeley Road," she said. "The Wharfage is currently accessible to pedestrian traffic so it is very much business as usual here in the Ironbridge Gorge and I would encourage people to come down and visit us to support our fantastic business community. 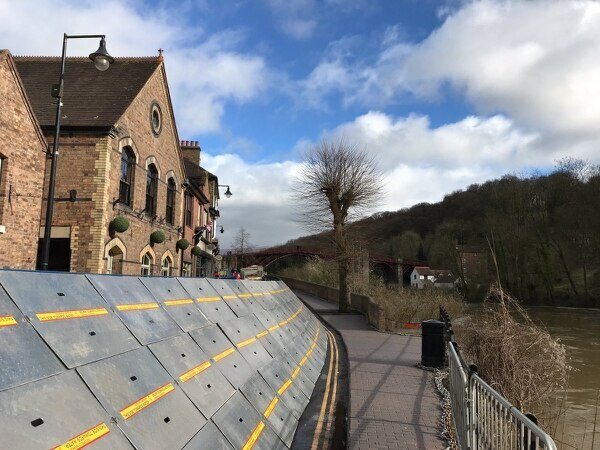 "We are working to ensure that all businesses can remain open and operational during the deployment, and we have tried to ensure that the public are aware that Ironbridge is open for business as usual with clear signage along the diversion routes." Flooding is expected to reach a peak of 5.2 to 5.5 metres at Buildwas, near Ironbridge, on Tuesday. Councillor Lowery added: "From speaking to businesses many have actually seen an increase in footfall this weekend as the rising river levels and deployment of the barriers are quite an attraction and of interest to many. 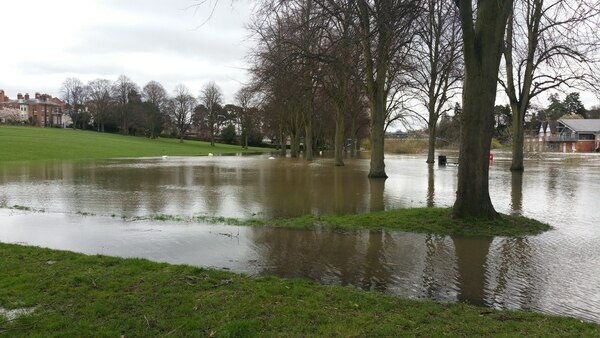 "Dale End Park is sadly underwater and flooding is predicted to peak on Tuesday so we continue to closely monitor the situation. "I would like to thank every officer that has been on site over the last few days and it has been great to see the resilience and community spirit being shown in the Gorge in working together on this." There were 20 flood warnings and 28 flood alerts in force in England on Monday morning, with the majority in Yorkshire and the Midlands. The forecast for the coming week is an improvement last week's wet and windy weather. The Met Office said while western parts of the country should expect more rain on Monday, conditions should get drier and warmer throughout the week. Meteorologist John West said the high river levels were due to heavy downpours over the weekend, with parts of Wales having half a month’s rain in the space of a day. He added: "We saw quite a lot of rain in western areas over the last few days, which helps to top up river levels."